This entry was posted on Friday, February 15th, 2013 at 11:16 am	and is filed under Care & Maintenance, Growth, mowing, Planting, watering, Zoysia. You can follow any responses to this entry through the RSS 2.0 feed. Both comments and pings are currently closed. Where can I find the amazoy plugs? 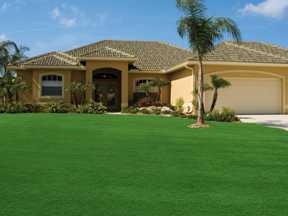 There are over 3 dozen different types of zoysia grass, our Amazoy zoysia grass is the orginial zoysia, the Meyers Z52. Each zoysia is a little different such as blade width, growth pattern, water requirements, cold tolerance, maintenance, many do not perform as ours does. To determine the type of zoysia you have, you could take a small sample to your local nursery they should be able to identify it. From what you decribed it sounds like it could be the Meyers Amazoy zoysia, which is what we do sell. It does not sound like the area you are planning to plant is within the other zoysia, so it will be fine. What type of zoysia do you recommend for heavy shade? Zoysia grass usually performs better in the sun then shade. We only sell the Meyers zoysia which requires at least 2 to 3 hrs of direct sunlight a day. I am not real familiar with the other types of zoysia grasses as far as requirements and maintenance. I have established Meyers. When and what product is best for fall pre emergent and spring pre emer.? This is not a general questions I can answer, since several things would determine what is best. When to apply and what type of pre-emergent you decide to use really depends on what weeds you are wanting to eliminate and what products are allowed in your area. I would suggest checking with your local garden center and see what they recommend for your area and follow the labels instructions on when and how to apply. The product label should also tell you what type of weeds it will destroy. We are happy to hear you enjoy our site. We do hope you continue to visit us. I live in the 90305 zip code and I have a dog. I want a grass that will tolerate the dog and I understand that zoysia grass may be the answer. What type of zoysia would be best? Current lawn has many bare spots. Would zoysia grass crowd out the current lawn if planted by plug or seed, or do I need to start from scratch? We love our dogs, but they can do a number on our lawn. Meyers Amazoy zoysia grass is very durable and is more tolerant of pet urine and feces than most grasses. When the grass is first planted you would need to keep the dogs off of the grass for the first 30 days. You can plant the plugs right within your current lawn, you do not need to remove the grass already there.